Over the last few years, social selling has gained more and more traction in the B2B sphere, as more and more industry studies demonstrate its effectiveness. As a strategy, social selling looks to leverage social media channels to start more business conversations, qualify leads better and move prospects down the sales funnel faster. When you consider that 75% of B2B buyers and 84% of C-level executives use social media to make purchasing decisions, it’s not surprising that 78% of salespeople using social selling outsell their peers. And yet, having a social selling programme in place is not that common. There are a lot of companies that still think of social media as an extremely time-consuming strategy, imagining their sales reps will need to spend countless hours browsing Facebook, LinkedIn or Twitter before they start seeing any sort of results. Luckily, the reality is a bit different, and we speak from experience. At SoAmpli, we practice what we preach. Social selling isn’t just what we empower our clients to put into practice, but it is also what we do every day to increase sales for our own business. Being a young company with big growth goals, time is of essence for us. Our team members spend around three minutes every day on SoAmpli, sharing impactful social media content that helps them get in front of the right people, start more conversations and close more deals. Sounds too good to be true? 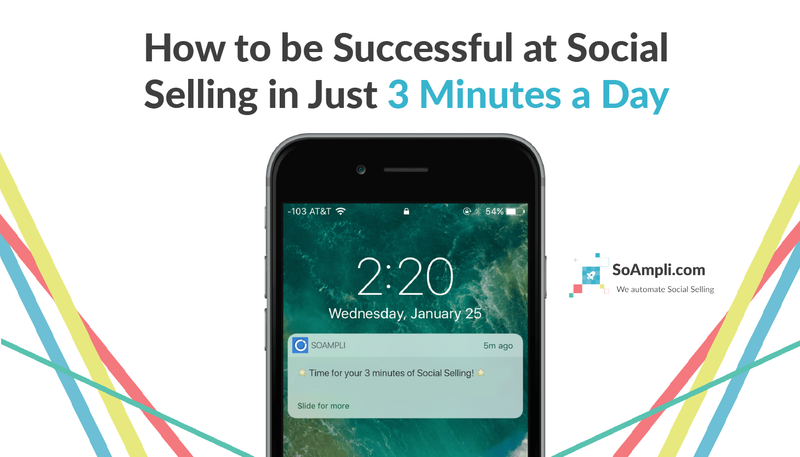 Let’s have a closer look at how using SoAmpli’s social selling platform helps you achieve sales success in less than 3 minutes a day. The average salesperson has around 1,000 connections between LinkedIn, Twitter and Facebook. In most cases, these are highly relevant, like-minded people that work in your industry and are connected with thousands of potential clients, investors and advisors. However, switching between different platforms to share your content can become a bit of a nightmare, especially when it comes to checking the impact of what you’re sharing. 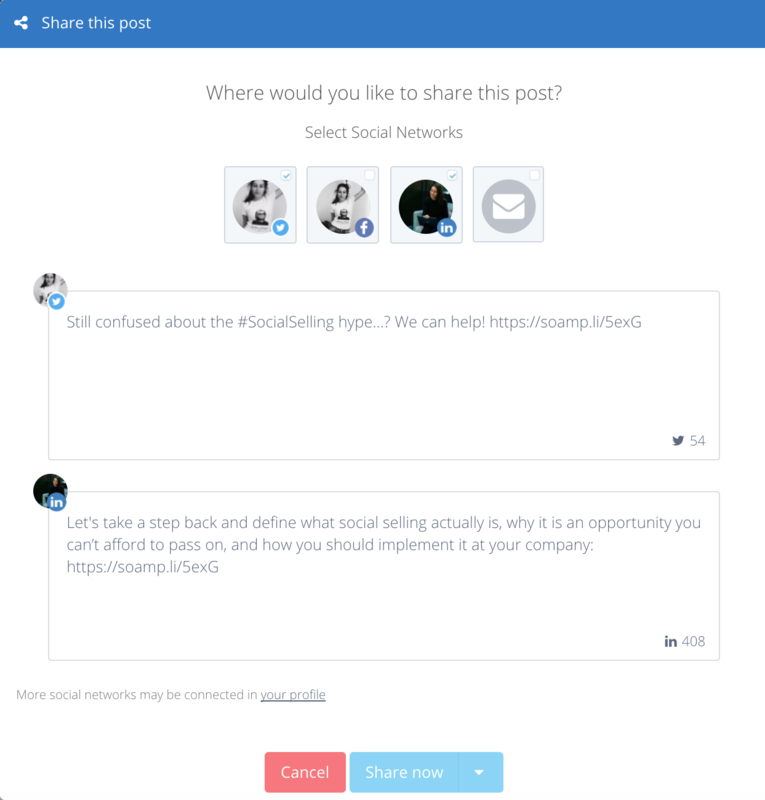 SoAmpli provides a place where you can share the same story with all your social accounts in just one click. But it’s not just sharing everywhere instantly that makes the difference. You can also customise each message for your separate social channels before they go out, making sure your message is fine-tuned to the ears of your audience on each channel (crafting your message for each platform is crucial, but, if you don’t have a lot of time, even simple changes like adding hashtags for Twitter posts can make a big difference!). Scheduling your social content for the week shouldn’t have to take longer than drinking your Monday morning coffee. 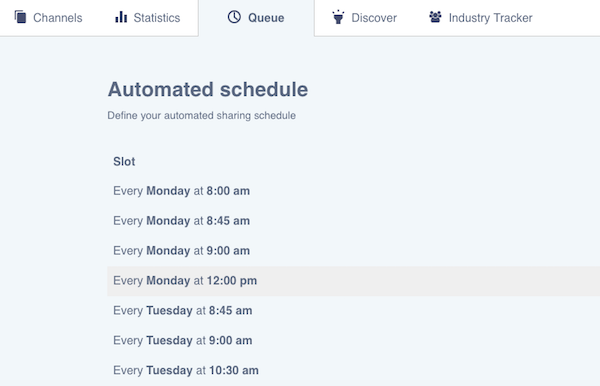 Taking the manual process out of scheduling, that’s the idea our automated scheduling is built on. All you have to do it set up regular times you’d like your posts to go out, and you’re done! When setting up your schedule, try to think of your connections’ habits. When are they most likely to be browsing on Twitter? Is it in the morning, during their commute? Or during their lunch break? And how about your prospects and clients in different timezones? If you have posts you’d like to be published at a specific time and date, you can still use our regular schedule feature! Analysis of what works and what doesn’t can traditionally take as long or longer than sourcing the content in the first place. While learning from your content is extremely important, spending days looking at each platform, gathering the necessary information is definitely not what you should be doing. It goes without saying that if you can publish to all your channels on one platform, you should be able to see the stats for all of them as well. 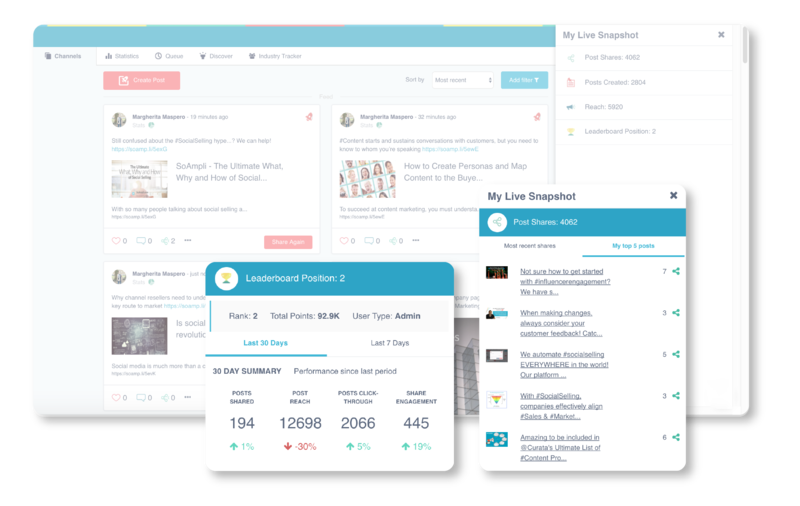 SoAmpli helps you cut down time by analysing all the content you share through the platform and present it to you in the most consumable way possible. Saving time is important, but make sure that the job is done correctly should always be the bigger concern. 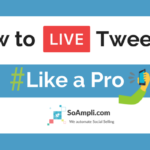 With social selling and SoAmpli, you don’t have to compromise one to improve the other! We love helping companies make greater use of their time without compromising the quality of their content or their sales results. 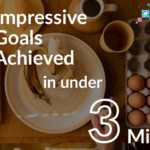 If you’d like to see what you can achieve in three minutes per day, visit SoAmpli or book a demo to discover how you can help your entire sales team sell more on social media!